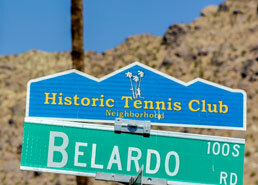 The Historic Tennis Club neighborhood is the beating heart of Downtown Palm Springs. With 11 of the structures registered as historic, the past and present intersect on every corner. The neighborhood takes its name from “The Tennis Club Resort” – the celebrated inn, restaurant, and tennis complex founded in 1937 that brought world-class tennis to the desert. History is evident through every window and residents of the Historic Tennis Club passionately protect the character of their neighborhood and invite you to experience its magic!